Keeping the memory alive and breathing new life into the property! The Catskill Game Farm closed in 2006 – it was the first privately owned zoo in the United States, operational from 1933-2006 and housed over 2,000 animals. Among their collection included giraffes, rhinos, pygmy hippos, capybara, and many more. 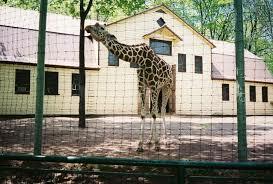 The zoo itself is approximately 150 acres with 3.5 miles of paved walkways and 130 structures. It is now often visited by people for the sake of nostalgia, urban exploration and/or photography. If you have any additional questions please feel free contact us. Giraffe born at The Catskill Game Farm - NOT April..
April the Giraffe is originally from The Catskill Game Farm! Believed to be April at The Game Farm.. Visitors are allowed to walk the property! All visits must be scheduled in advance. There are big plans for the property, which we are excited to share with you! All donations go to making the park available and safer for visitors to walk the property each season. Ready to take the next step?